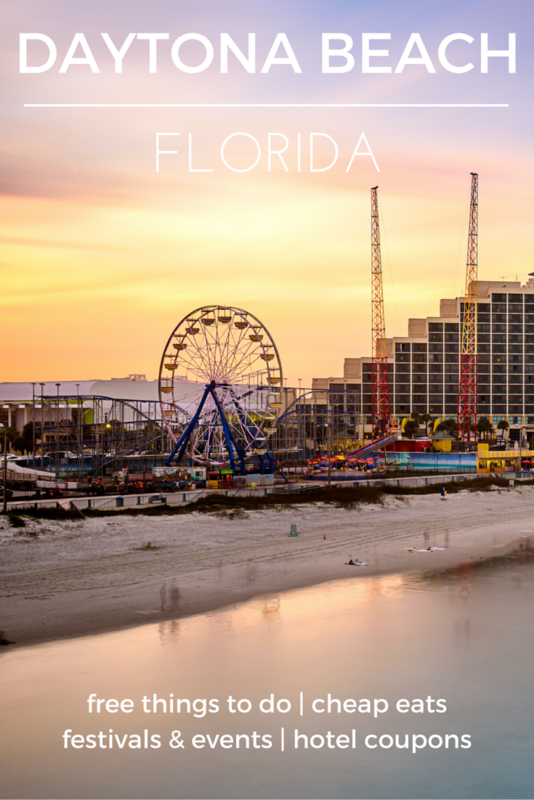 Experience the ultimate Florida beach vacation at Daytona Beach, your destination for a budget-friendly trip to the Sunshine State. Explore all Daytona has to offer, from the famous Daytona International Speedway, home of NASCAR races like the Daytona 500 and the Rolex 24, where you can take a tour or watch a race; to the popular beaches themselves, where you can park your car on the sand for a completely unique beach day. Visitors and locals alike love Ponce Inlet & Lighthouse Point Park, where for just $5/car you can enjoy excellent beach facilities, impressive waves for surf lovers, nature trails and more. For a spectacular view, grab a ticket to climb the 203 stairs to the top of the Ponce de Leon Inlet Lighthouse. Many travelers also enjoy the pet-friendly dog beach nearby. At Ponce Inlet, guests can also explore the Marine Science Center, where you’ll view exhibits, view a living reef aquarium, look inside a sea turtle’s nest, and see sea turtle rehabilitation in action. If you’d like a day on the green rather than a day on the sand, LPGA International’s two championship courses are just a few minutes inland. Whether you prefer soaking in some rays on the gorgeous white-sand beaches, high-speed laps around the Speedway or exploring the area's colorful history and culture, Daytona Beach offers an incredible variety of vacation options. When you’re in Daytona, you can enjoy the beach any time of day or night! There’s no better destination for fun in the sun. Looking for a quiet beach away from the tourist areas of Daytona Beach? Then North Peninsula State Park is for you! You’ll love the quiet, two-mile beach within the park, plus you make spot some natural Florida wildlife. Head to Ocean Avenue and see the historic bandshell made of coquina stone (sea shells). This impressive venue offers a unique beachfront location for concerts and more. Don’t miss out on free summer concerts here. The stained-glass ceiling of The Casements atrium will take your breath away, and the entire house will take you on a historic journey. Originally the home of John D. Rockafeller, Sr., The Casements is now a museum and cultural center. Tour the oldest house in Daytona Beach! This hidden gem, beautifully furnished with antiques, will provide a look back in time. Entrance is free but donations are appreciated. Walk the beautiful campus established in 1904, and tour the home of the founder, Dr. Mary McLeod Bethune. The impressive red-brick White Hall is on the U.S. National Register of Historic Places. The serene botanical gardens are built on the site of 16th century sugar mill ruins. Visitors can stroll through the gardens, complete with flowers and plants native to Florida. The whole family will enjoy the sugar mill ruins and dinosaur statues. This free oceanfront water park is ideal for kids and adults looking to cool off on a hot summer day. Picnic tables also make this a convenient picnic spot view an unbeatable view. Get your fix of both art and nature by choosing this museum near Daytona Beach. You’ll enjoy permanent and seasonal art exhibits, plus a rainforest-inspired garden. Enjoy a free, 20-minute guided tour of a gourmet chocolate factory in the heart of Daytona. Tours are available Monday – Saturday. You may even get to taste-test!